The Race: This was the queen stage, the big one, with nary a flat meter to be found. 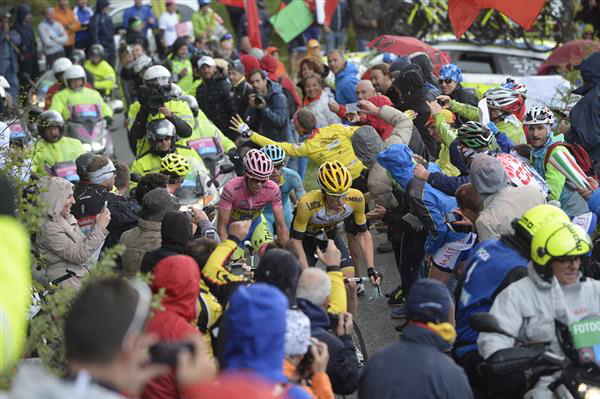 Race leader Alberto Contador found himself in trouble when he flatted descending from Aprica, 60 kilometers from the finish. This was the first of two times up to Aprica. Immediately both Katusha and Astana began hammering the front, knowing this was a rare opportunity to put Contador out the back door. Contador's team dragged him back, and by the time they reached the foot of the penultimate climb, the Mortirolo, he was still a minute back. On the Mortirolo Contador first caught and passed second-place Fabio Aru, who wasn't having a good day. 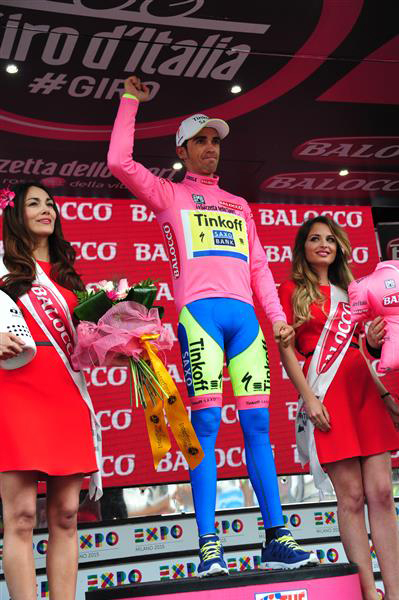 By the time he reached top, Contador had caught Mikel Landa and Steven Kruijswijk. That trio disappeared down the road. Meanwhile Aru flatted. The leading trio blitzed up the second Aprica ascent. First Kruijswijk tried to get away and then Landa dropped the hammer. That was it. 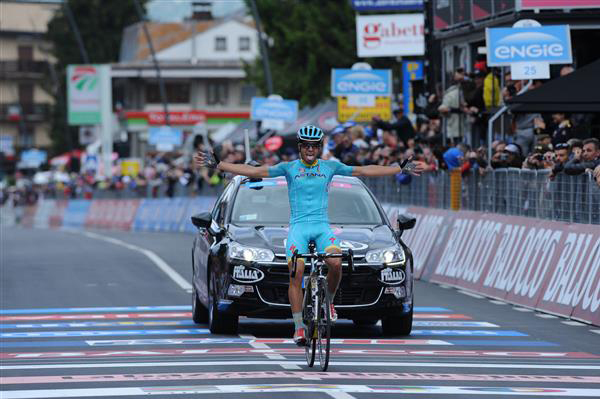 Landa soloed to the finish to win his second 2015 Giro stage in a row. 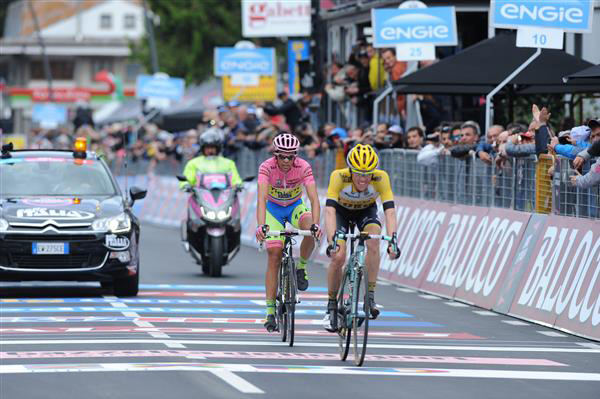 Kruijswijk and Contador came in about a half-minute later. The result? Contador now leads the Giro by more than four minutes and Mikel Landa is sitting in second place, having displaced the struggling Fabio Aru. 3 CONTADOR Alberto TINKOFF-SAXO s.t. 5 AMADOR Andrey MOVISTAR s.t. 10 BETANCUR Carlos Alberto AG2R-LA MONDIALE s.t. 13 MONFORT Maxime LOTTO-SOUDAL s.t. 14 ANTON Igor MOVISTAR s.t. 16 ATAPUMA Jhon Darwin BMC s.t. 18 NIEVE ITURALDE Mikel SKY s.t. 19 BOLE Grega CCC SPRANDI POLKOWICE s.t. 20 MOINARD Amaël BMC s.t. 21 URAN Rigoberto ETIXX-QUICK STEP s.t. 22 KANGERT Tanel ASTANA s.t. 23 MONTAGUTI Matteo AG2R-LA MONDIALE s.t. 25 CARDOSO Andre Fernando CANNONDALE-GARMIN s.t. 26 PELLIZOTTI Franco ANDRONI GIOCATTOLI s.t. 29 NIEMIEC Przemyslaw LAMPRE-MERIDA s.t. 30 GAVAZZI Francesco SOUTHEAST s.t. 31 HENAO Sebastian SKY s.t. 32 MONSALVE Jonathan SOUTHEAST s.t. 33 MIHAILOV Nikolai CCC SPRANDI POLKOWICE s.t. 34 CHAVES Johan Esteban ORICA-GREENEDGE s.t. 35 BURGHARDT Marcus BMC s.t. 36 BROWN Nathan CANNONDALE-GARMIN s.t. 37 ZAKARIN Ilnur KATUSHA s.t. 38 BOOKWALTER Brent BMC s.t. 39 PATERSKI Maciej CCC SPRANDI POLKOWICE s.t. 40 DUPONT Hubert AG2R-LA MONDIALE s.t. 41 DILLIER Silvan BMC s.t. 42 GILBERT Philippe BMC s.t. 44 VAN DER LIJKE Nick LOTTO NL-JUMBO s.t. 45 KEIZER Martijn LOTTO NL-JUMBO s.t. 46 BOUET Maxime ETIXX-QUICK STEP s.t. 47 INTXAUSTI Benat MOVISTAR s.t. 48 FERNANDEZ Rubén MOVISTAR s.t. 49 DE LA CRUZ David ETIXX-QUICK STEP s.t. 50 ZARDINI Edoardo BARDIANI-CSF s.t. 51 CUNEGO Damiano NIPPO-VINI FANTINI s.t. 52 NOCENTINI Rinaldo AG2R-LA MONDIALE s.t. 53 CHAVANEL Sylvain IAM CYCLING s.t. 54 ROUX Anthony FDJ s.t. 55 ARMEE Sander LOTTO-SOUDAL s.t. 61 FINETTO Mauro SOUTHEAST s.t. 62 BONGIORNO Francesco BARDIANI-CSF s.t. 63 ELISSONDE Kenny FDJ s.t. 65 KIRYIENKA Vasil SKY s.t. 66 SAMOILAU Branislau CCC SPRANDI POLKOWICE s.t. 68 ROSA Diego ASTANA s.t. 69 FORMOLO Davide CANNONDALE-GARMIN s.t. 70 SLAGTER Tom Jelte CANNONDALE-GARMIN s.t. 71 GRMAY Tsgabu LAMPRE-MERIDA s.t. 72 VILLELLA Davide CANNONDALE-GARMIN s.t. 73 LUDVIGSSON Tobias GIANT-ALPECIN s.t. 74 GRETSCH Patrick AG2R-LA MONDIALE s.t. 75 RUTKIEWICZ Marek CCC SPRANDI POLKOWICE s.t. 76 COURTEILLE Arnaud FDJ s.t. 77 CHERNETSKY Sergey KATUSHA s.t. 78 ROVNY Ivan TINKOFF-SAXO s.t. 79 SABATINI Fabio ETIXX-QUICK STEP s.t. 80 BASSO Ivan TINKOFF-SAXO s.t. 81 ROGERS Michael TINKOFF-SAXO s.t. 82 SANCHEZ Luis Leon ASTANA s.t. 83 TVETCOV Serghei ANDRONI GIOCATTOLI s.t. 85 PUCCIO Salvatore SKY s.t. 86 BERLATO Giacomo NIPPO-VINI FANTINI s.t. 87 BOARO Manuele TINKOFF-SAXO s.t. 88 HANSEN Adam LOTTO-SOUDAL s.t. 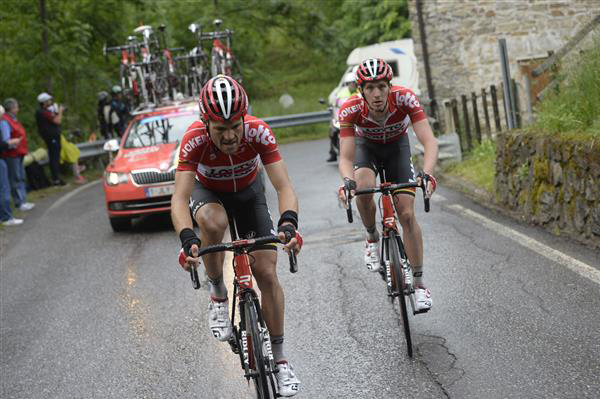 89 BAK Lars Ytting LOTTO-SOUDAL s.t. 90 BISOLTI Alessandro NIPPO-VINI FANTINI s.t. 91 PAULINHO Sergio Miguel TINKOFF-SAXO s.t. 92 STORTONI Simone ANDRONI GIOCATTOLI s.t. 93 FAVILLI Elia SOUTHEAST s.t. 94 FRAPPORTI Marco ANDRONI GIOCATTOLI s.t. 95 REZA Kevin FDJ s.t. 96 MALACARNE Davide ASTANA s.t. 97 QUINTANA Dayer Uberney MOVISTAR s.t. 98 HERRADA Jesús MOVISTAR s.t. 99 CLARKE Simon ORICA-GREENEDGE s.t. 100 MOUREY Francis FDJ s.t. 102 WEENING Pieter ORICA-GREENEDGE s.t. 103 VEIKKANEN Jussi FDJ s.t. 104 BATTAGLIN Enrico BARDIANI-CSF s.t. 105 COLBRELLI Sonny BARDIANI-CSF s.t. 106 JUUL JENSEN Christopher TINKOFF-SAXO s.t. 108 ULISSI Diego LAMPRE-MERIDA s.t. 109 IZAGUIRRE Jon MOVISTAR s.t. 111 BUSATO Matteo SOUTHEAST s.t. 112 BELKOV Maxim KATUSHA s.t. 115 BEWLEY Sam ORICA-GREENEDGE s.t. 116 MATYSIAK Bartlomiej CCC SPRANDI POLKOWICE s.t. 117 HOULE Hugo AG2R-LA MONDIALE s.t. 118 ARNDT Nikias GIANT-ALPECIN s.t. 119 HAGA Chad GIANT-ALPECIN s.t. 120 HEPBURN Michael ORICA-GREENEDGE s.t. 121 BROECKX Stig LOTTO-SOUDAL s.t. 122 KEISSE Iljo ETIXX-QUICK STEP s.t. 124 PORSEV Alexander KATUSHA s.t. 125 VIVIANI Elia SKY s.t. 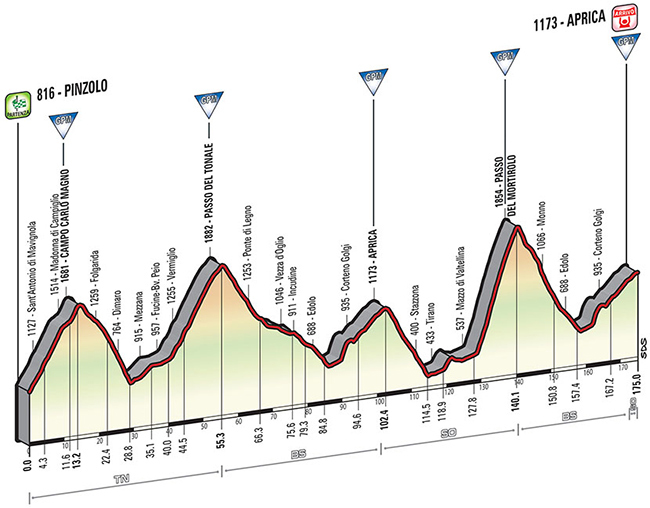 127 PETACCHI Alessandro SOUTHEAST s.t. 128 DOMONT Axel AG2R-LA MONDIALE s.t. 129 MEZGEC Luka GIANT-ALPECIN s.t. 130 LANCASTER Brett ORICA-GREENEDGE s.t. 131 ZABEL Rick BMC s.t. 132 ALAFACI Eugenio TREK s.t. 133 BÉRARD Julien AG2R-LA MONDIALE s.t. 134 POLANC Jan LAMPRE-MERIDA s.t. 135 APPOLLONIO Davide ANDRONI GIOCATTOLI s.t. 136 FLENS Rick LOTTO NL-JUMBO s.t. 137 VAKOC Petr ETIXX-QUICK STEP s.t. 139 HOFLAND Moreno LOTTO NL-JUMBO s.t. 140 WATSON Calvin TREK s.t. 141 MALAGUTI Alessandro NIPPO-VINI FANTINI s.t. 142 LINDEMAN Bertjan LOTTO NL-JUMBO s.t. 143 HAUSSLER Heinrich IAM CYCLING s.t. 144 BEPPU Fumiyuki TREK s.t. 145 STACCHIOTTI Riccardo NIPPO-VINI FANTINI s.t. 147 EISEL Bernhard SKY s.t. 148 STAMSNIJDER Tom GIANT-ALPECIN s.t. 149 MODOLO Sacha LAMPRE-MERIDA s.t. 150 LOBATO Juan Jose MOVISTAR s.t. 151 RICHEZE Ariel Maximiliano LAMPRE-MERIDA s.t. 154 KOCHETKOV Pavel KATUSHA s.t. 155 COLEDAN Marco TREK s.t. 156 FISCHER Murilo Antonio FDJ s.t. 157 NIZZOLO Giacomo TREK s.t. 158 ACEVEDO Janier Alexis CANNONDALE-GARMIN s.t. 159 ZHUPA Eugert SOUTHEAST s.t. 160 BARBIN Enrico BARDIANI-CSF s.t. 161 BOEM Nicola BARDIANI-CSF s.t. 162 FERRARI Roberto LAMPRE-MERIDA s.t. 164 PINEAU Cedric FDJ s.t. 165 CHENG Ji GIANT-ALPECIN s.t. 168 DE BACKER Bert GIANT-ALPECIN s.t. 169 SILVESTRE Fabio TREK s.t. 170 GESCHKE Simon GIANT-ALPECIN s.t. 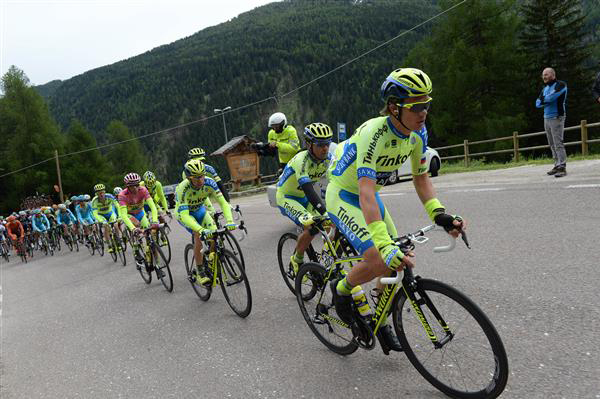 Tinkoff-Saxo lined up on the Tonale, working for pink jersey'd Alberto Contador. Maxime Monfort and Jurgen Van den Broeck do the first Aprica ascent. Carlos Betancur and Damiano Caruso on the same climb. Incredible! 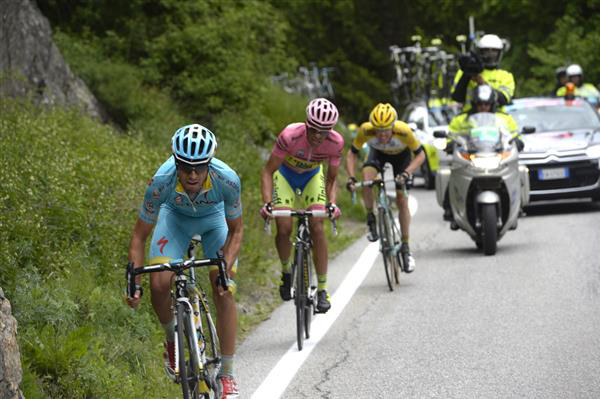 Steven Kruijswijk leads Alberto Contador and Mikel Landa up the Mortirolo. 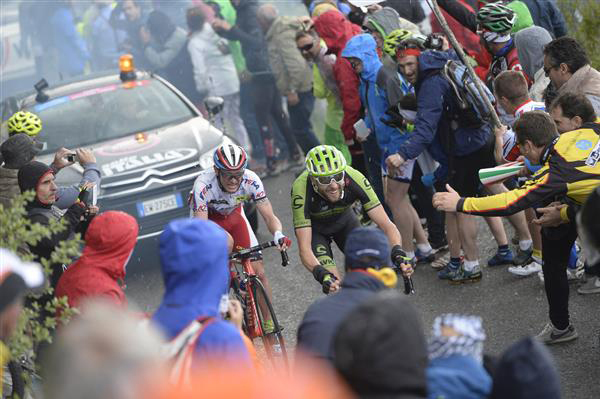 Not too far back, Ryder Hesjedal leads Yury Trofimov up the Mortirolo. 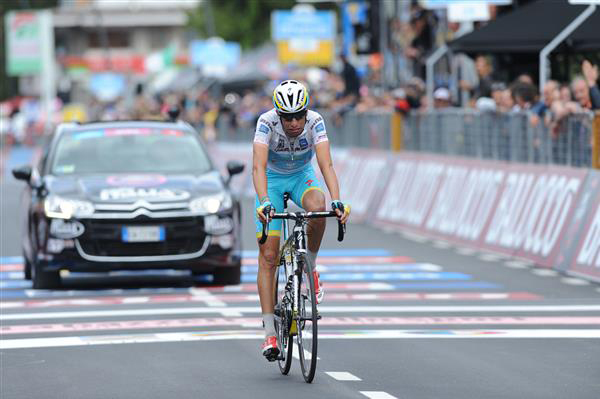 Fabio Aru does his best to limit the damage. 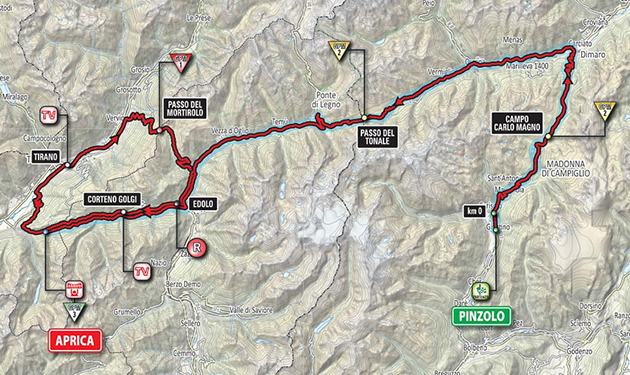 On the second Aprica ascent: Mikel Landa is dropping the hammer on Alberto Contador and Steven Kruijswijk. 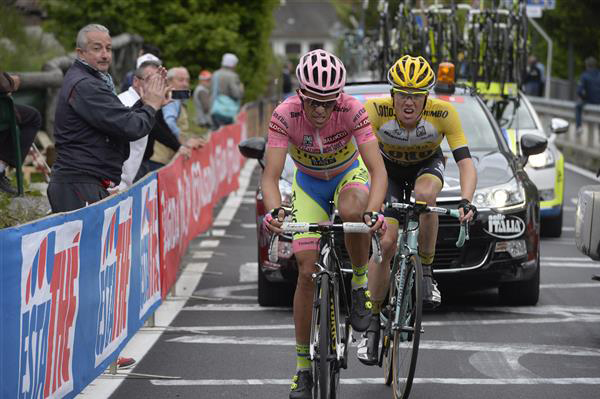 Contador and Kruijswijk work to limit the damage. 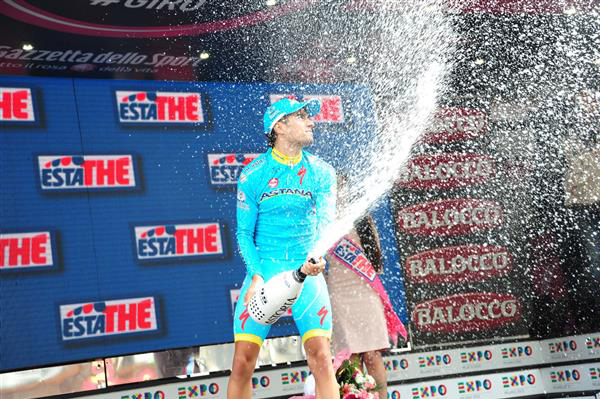 Mikel Landa wins his second Giro stage in a row. Steven Kruijswijk and Alberto Contador finish. Fabio Aru finishes nearly 3 minutes after Landa had crossed the line. Mikel Landa celebrates his second stage victory in a row.